There are many realtors out there who are known to give a gift to newly settled customers. They often choose a gift as a token to say thank you. We all know how excited new home owners can get on the possession of their new home. So wouldn’t it be excited to give them the first gift they can use as soon as they shift into their new home? Here we are talking about custom address stamp. A custom address stamp is one of the best gifts because it gives you a unique chance to say a thank you while marketing your company and services. Custom address stamps allow you to add a customized message to the mount’s index, which makes it a powerful marketing tactic since it combines your unique message with a much needed product that people use on a regular basis. Moreover, the success of your promotion item is generally based on how often a person uses it. So everyone who is writing a mail, needs to write down the return address and this is when address tamps will be used. Few weeks after the closing, the new homeowner is changing address and giving out the new address to his friends and family. Your message will be at their fingertips each time, increasing the opportunity for word of mouth marketing. In addition, self-inking address stamps last for thousands of impressions, keeping your message in front of the client for years to come. In addition, customized address stamps can easily include multiple lines of text which can be used to include phone number, email address along with name and address. Most real estate agents use the new home owner’s name and address because it naturally fits with their business relationship, but any custom message can be included on the stamp. At Ideal Stamp Shop, we offer a wide range of custom stamps to choose from. 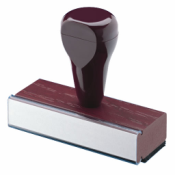 You can use the stamp to promote your business, gift a friend or use one for your personal or professional use. Moreover adding the touch of a personal rubber address stamp to your correspondence is the perfect finishing touch to a realtor/client business relationship and has benefits for both you and your client.